BRYAN EATON/Staff Photo. 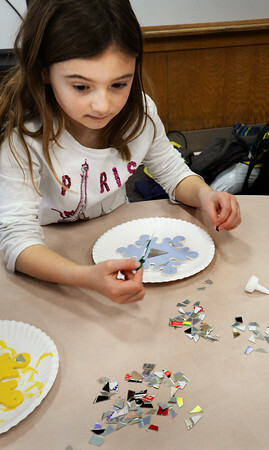 Heloise Langlais, 8, chooses different pieces of old cd's that have been cut up as she glues them to a snowflake mosaic. She was in Recyclable Artwork in the Explorations Program at Newbury Elementary School.